From both a personal and professional perspective, we have known the Sweeney’s for over 20 years. Their high moral integrity, enthusiasm, great people skills, and in depth knowledge of all areas associated with the real estate market provide us with absolute faith. I rarely take the time to write a testimonial…I’m often selfish with my time and seem to be better at finding faults than successes. I was compelled to write this one because we truly had a fantastic home buying experience with team Sweeney and they have more than earned our gratitude. All aspects of the home buying process were completed with great care and attention to detail. Their schedule was flexible and accommodating to our needs. Communication was open, honest, and easy. My questions were answered thoroughly, and each of my requests were given attention. There is no doubt we were represented well by Team Sweeney. I highly recommend their services to anyone buying or selling a home. Now that we’ve completed the closing on my mother’s home, I wanted to take a few minutes to share how appreciative I am of the efforts of The Sweeney Team put forth in order to accomplish this sale. I admit I was more than a little nervous about selling my mother’s home from two thousand miles away, particularly in the Las Vegas area. I needed to rely on a team with knowledge of the area and my personal situation which was both complicated and personal. Yet from the first meeting, I found a sincerity and confidence that made it easy to trust The Sweeney’s with the house sale. There were a number of occasions when you and your staff went above and beyond the call of duty, and I am truly thankful for all that you did. Thank you so much for helping me locate and purchase the perfect new home for me. I very much appreciate your commitment, patience, and perseverance in our dealing over the past several months, and the efficient work of your team. I came to you as a referral from my daughter and son in law whom you helped with their house two years prior, and who were pleased with the way you worked with them. For all of us, The Sweeney Team has made the house hunting, buying and selling process smooth, successful, and enjoyable experiences. As a California real estate broker myself, I recognize professional excellence in fellow practitioners, I do not hesitate to recommend The Sweeney Team most highly! My husband was referred to Bob, of The Sweeney Team via a work associate. Before deciding to hire The Sweeney Team. We spoke at length about real estate properties in general throughout the Las Vegas Valley. The knowledge of the area and helpful advice shared were the reasons we decided to use The Sweeney Team. They delivered the highest quality of service through every step of our buying process. Any issue that arose, was handled and resolved quickly. Once our California property closed, our urgency and need to close were communicated clearly, and the team worked tirelessly to close our escrow in 14 days! The process and our transition were made seamless. To this day, the team is there for support and questions about the area. After three real estate transactions, by far this has been the best. 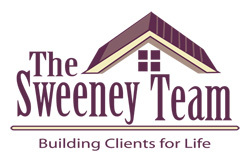 We always refer the Sweeney Team to anyone in need of a real estate agent in the Las Vegas area. The Sweeney Team stayed on top of the process every step of the way, to ensure we had a fast turnaround. You have our respect and gratitude. I had the pleasure of working with Dan on two personal real estate transactions over 3 years. Dan was extremely professional, forthright, personable & passionate. Dan didn’t just show me houses he helped me purchase one, Dan didn’t just list my home, he helped me sell it. To me, THAT’S what defines a great realtor. Dan is honest with integrity. He is a man of his word, responsive & reliable. Dan is very knowledgeable about the Las Vegas real estate market. Consequently, he is very forthcoming in providing sound advice. Thank you for the opportunity to recommend Dan. Dan’s negotiation skills are numerous & the success of my sale goes to Dan. Thanks again for Dan’s professionalism & quick sale of my home. Dan guided us through the initial phase of educating us on the housing market & even helped us stage our home for the best possible presentation. It is one thing to have a realtor who fully understands the market; however, it’s a complete bonus to have one who treats your home as his own. We decided to sell our home, we interviewed several different realtors. When, we decided on Sweeney Team. Dan is a man of integrity that is unsurpassed and has a great work ethic. We can’t say enough about The Sweeney Team, great to work with. We highly recommend them to our family & friends. We relocated from Florida, we were immediately impressed with Dans enthusiasm. I highly recommend Dan. He is hard working, trustworthy and knowledgeable of the local real estate market. This was our 7th home purchase. When we say you were the best, we feel we speak from experience. Dan, I have been in the lending industry for 25 years. I was impressed with your overall skills as a realtor. Your negotiation abilities & knowledge was invaluable to me. When we decide to move again we will certainly use you & your excellent services to assist us. Thanks Dan, for all you’ve done for us. You’re not only honest, but a true all-around fun individual. Anyone will undoubtedly be impressed and lucky to find you. We feel privileged to have worked with Dan & with out hesitation provide the highest recommendation for him. He will make anyone’s Vegas house hunt a pleasant experience. Dan & Bob supported us in every way possible. We recommend The Sweeney Team to anyone looking for professional support, responsive services & expert advice in obtaining or selling a home. First & foremost Dan, as a realtor your greatest strength must be the way you listen to your clients.